This episode is a bit different than my usual podcast. You’ll hear about Mighway and Harvest Hosts who work with each other to provide unique experiences on the road. Mighway is a peer-to-peer rental platform, like Airbnb, but for RVs. Harvest Hosts has relationships with wineries, breweries, farms, golf courses and other appealing destinations that allow you to stay overnight on the properties in an RV. 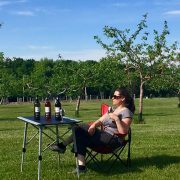 Traveling on the road in an RV is something my wife and I have discussed doing, especially when I travel to visit wineries and other experiences On The Wine Road. Mighway and Harvest Hosts has made it easier to do. If you like being on the road these two options offer a great way to travel to the experiences you enjoy.